“My Haunted Heart” is the title of the February 4, 2014 episode of Ravenswood, and ABC Family has just now released some promotional images and a description for it. Burbank, CA (January 15, 2014) – Caleb is thrown when his Rosewood ex Hanna shows up in Ravenswood, in “My Haunted Heart,” the winter finale episode of ABC Family’s original series, “Ravenswood,” airing Tuesday, February 4th (9:00 – 10:00 PM ET/PT). 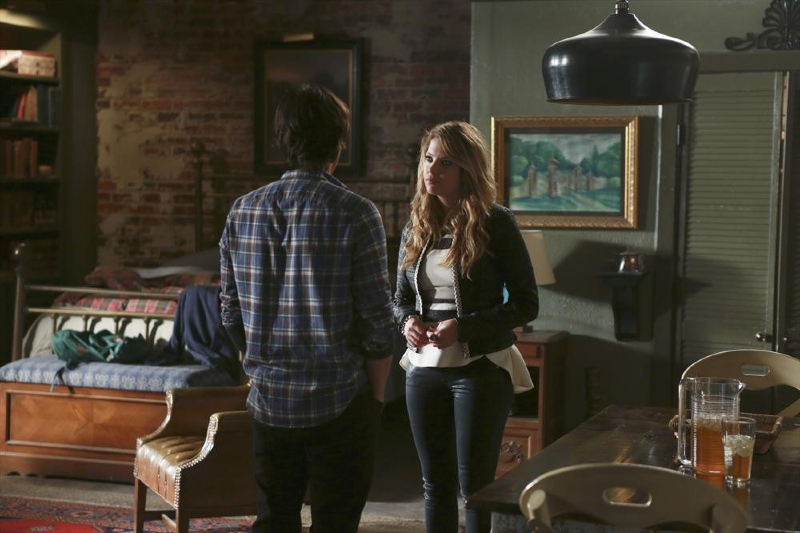 Caleb finally has to clue Hanna in to some of what has been happening in Ravenswood when she shows up demanding to speak to Miranda about “stealing” him away. Luke and Olivia finally learn what really happened to their father and who was responsible. With the walls closing in around him, Dillon makes a drastic move. And when Remy goes missing, the rest of “The Five” are desperate to rescue her, leading to an intense showdown with everyone’s lives in peril. “Ravenswood” is produced by Alloy Entertainment in association with Warner Horizon Television and is executive produced by Joseph Dougherty, Oliver Goldstick, I. Marlene King, and Leslie Morgenstein. The series stars Nicole Gale Anderson, Tyler Blackburn, Steven Cabral, Brett Dier, Britne Oldford, and Merritt Patterson.